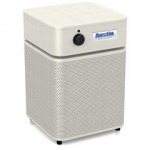 One of the best air purifiers on the market. Recommended for allergies and asthma. The HM200 is perfect for a one room application. Despite it’s compact size, the HM200 is a powerhouse for cleaning the air in your home. It filters and purifies up to 700 square feet every 30 minutes, removing harmful gases, noxious odors, and 99.97% of all particles down to 0.3 microns. The HM200′s energy efficient motor uses just 0.9 amps and 70 watts. It is whisper quiet and can be run continuously on high setting with no danger of overheating. Castor wheels available for $35.00 extra and a two week waiting period.